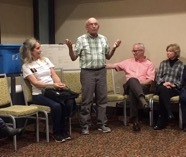 37 Bondurant Cousins attended this year's annual meeting in Midlothian, VA on Oct 19-20. The group held a Meet Your Kin session Friday evening at the La Quinta Richmond - Midlothian and enjoy moonshine drinks provided by Bondurant Brothers Distillery of Chase City, VA. On Saturday, members of the group posed for pictures on Bondurant Drive in Midlothian before lunch at the 250-year old Crab Louie Restaurant. 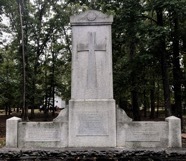 Following lunch, the group visited the Manakin Episcopal Church which is also the site of a monument to the Huguenot landing in 1700, the original site of the Manakin Huguenot Church, and the Manakin Huguenot Society building. 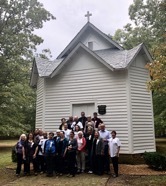 The group toured the 4th church on the original site and saw a plaque to Jean Pierre and Jacob Bondurant, original church members. 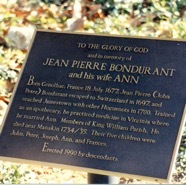 The group then visited the Jean Pierre Bondurant gravesite and future site of a new plaque to honor his wife, Ann Tanner. 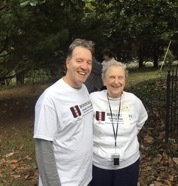 In the evening, the group visited The Half Way House Restaurant, a historic site dating from 1760 which hosted the likes George Washington, the Marquis de LaFayette, Patrick Henry, Thomas Jefferson, Robert E. Lee, James Whitcomb Riley and scores of others.